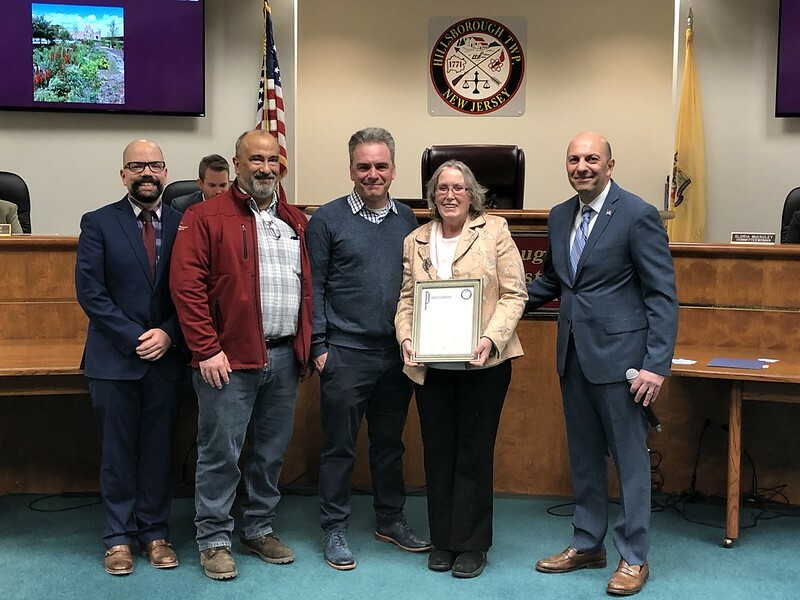 At the March 26th Township Committee Meeting, the Rutgers Cooperative Extension was recognized for its efforts to reduce flooding and clean the water of Royce Brook. The Township Committee also recognized Patricia Rector for her outstanding efforts in disconnection of stormwater, aquatic invasive species and youth and water programming. Hillsborough Township along with Rutgers Cooperative Extension (RCE) received a 319(h) Clean Water Act Grant from the NJ Department of Environmental Protection in 2014 grant to address areas of concern along the Royce Brook, a tributary to the Raritan River. The project is focused on engaging municipal staff and residents to adopt green infrastructure practices and techniques to help reduce flooding and improve water quality in the Royce Brook, and ultimately the Raritan River. Patricia Rector, Environmental Agent for RCE has been the project lead working alongside Dr. Christopher Obropta, Ph.D, P.E. Extension Specialist in Water Resources with RCE and Water Resources staff, and Tobiah Horton, Extension Specialist with the Rutgers Department of Landscape Architecture. They worked closely with the Township Committee, Hillsborough Sustainability Director, Department of Public Works, Department of Parks, Sustainable Hillsborough Steering Committee, the Environmental Commission, RCE Master Gardeners, Stony Brook-Millstone Watershed Association and township residents. Pat Rector has been with the Rutgers Cooperative Extension since 2009 and is also the statewide program coordinator of the RES Program at Duke Farms and the Rutgers Environmental Stewards Program which has resulted in numerous Hillsborough based projects through the years. She has conducted community based educational programs teacher in-service training for Next Generation Science Standards.